ALBERTA-BASED CREATIVE COMPANY EXPANDS ADVERTISING & MARKETING SERVICES BY ACQUIRING BANFF SIGN CO. AFTER 31 YEARS OF SUCCESSFUL OPERATIONS. BANFF, AB February 15, 2017 – With the federal government’s offer of free admission to all national parks to mark Canada’s 150th anniversary, Banff businesses are bracing for a record year in visitor attendance. Nearly 4 million people visited The Banff National Park in 2016, and that number is expected to rise significantly in 2017. 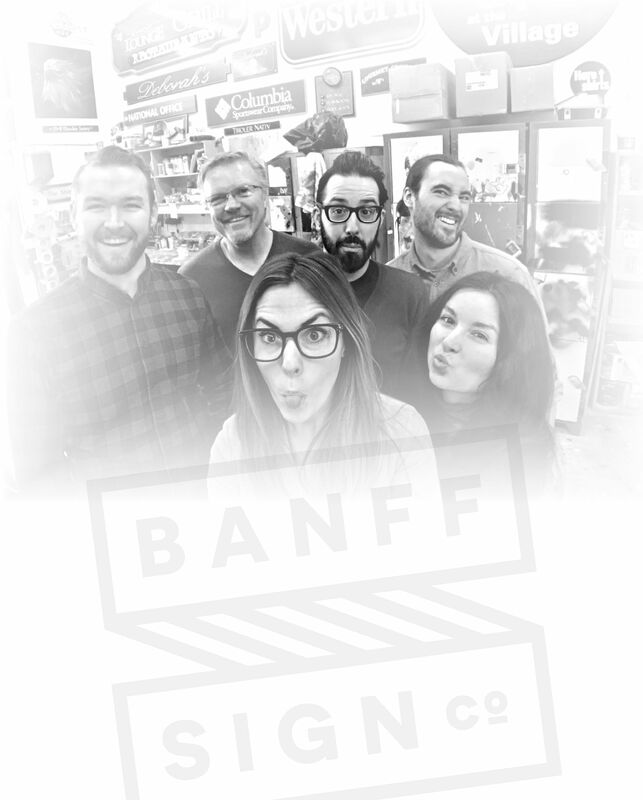 Banff Sign Co. has played a crucial role for more than 30 years, helping brand businesses and provide architecturally controlled wood carved signs to meet the Town of Banff by-laws & design policies. “Over the past 3 decades we have essentially created the standard in authentic hand-crafted signage in Banff,” says Larry Whan, original founder of Banff Sign Co. in 1986. “Our craft has become somewhat iconic. We’ve shipped signs all over the world to customers seeking a truly unique hand-made product. Sign making is an age-old art which take time, patience and vision.” Over the past 30 years Banff Sign Co. has done work for major international brands such as Starbucks, Patagonia, Lululemon and The North Face. Brendon Rayner, newly appointed General Manager of Banff Sign Co., brings over 16 years of sign making experience to the table. Rayner has worked alongside the Brennan’s for over 7 years in various management roles, from production scheduling to senior account management. “I’m confident Brendon has all the skills necessary to carry on my legacy” says Whan with pride. “These are exciting times, full of fresh blood and new ideas at a very, very busy time in Banff National Park. I wish them all the success in the world!” Whan will remain on-board in the coming months to assist with training and successful ownership transition. About Thinkwerx Inc. and 310-SIGN Inc. Established in 1986 in Banff, Alberta. Banff Sign Co. specialized in custom wood carved signs, custom wood fabrication, wide format digital printing and graphic design. Signs are created using Western Red Cedar and other fine woods, which are then laminated and hand-painted right here in Banff, Alberta, Canada.